During the 19th century, commerce between the United States and Mexico to the west boomed via the Santa Fe Trail. The Watrous (La Junta) National Historic Landmark at the meeting point of the Mora and Sapello Rivers in the La Junta Valley of New Mexico tells the story of the development of the valley during the Santa Fe Trail period. After the Santa Fe Trail opened to trade in 1821, many small towns and trading posts began to spring up along its route. The settlement of La Junta de los Rios Mora y Sapello (The Juncture of the Mora and Sapello Rivers) was one of the most prosperous of these small traders’ villages. Established c. 1835 and commonly known as La Junta, the town sits at the point where the Mountain and Cimarron Cutoff routes of the Santa Fe Trail joined. What began as a small farming community soon became an important rest stop for travelers headed east into the arid plains, or west toward the trail’s end in downtown Santa Fe. The sheltered and fertile valley supported the eventual development of several prosperous ranches, stagecoach stations, a Jesuit Mission and additional support structures for nearby Fort Union. The area was not only a bustling center of trade, but also a crucible of cultural interaction between American Indian, Mexican, and American travelers. Under Spanish rule of what is now the southwestern United States, the Spanish banned international trade of all kinds. When Mexico gained its independence from Spain in 1821, the Mexicans lifted these sanctions. Traders in the neighboring United States rejoiced because the western territory contained a wealth of resources and goods produced by American Indian Tribes and Mexican artisans. The Santa Fe Trail immediately became the primary economic route between the neighboring countries. It branched from Missouri (one of the western-most States at the time) into Mexico, terminating at the central plaza in Santa Fe in what is now the State of New Mexico. Along its route, small trading posts, villages and rest-points developed to aid and profit from the seemingly endless stream of travelers. Situated in an ideal setting in a fertile valley at the confluence of several rivers and surrounded by vast grasslands, La Junta was one such town. The valley was where the two branches of the Santa Fe Trail, the Mountain and Cimarron Paths, interconnected and merged just before crossing the Sapello River to the south. Around 1835, James Boney (aka Santiago Bone) and 30 others first established a town in the area after the Mexican government granted them the land to do so. This original village named Pueblo de Santiago was home to Boney (an Englishman), his Mexican wife, and several children until the early 1840s when Boney died in an American Indian attack. By 1846, Boney’s family abandoned the valley. Nothing remains of this settlement today. In 1843, John Scolly received another Mexican land grant to establish a town in the valley – La Junta. Well established by 1846, the village was a welcome stopping point along the Santa Fe Trail for fresh milk, cheese, and produce as well as whiskey. La Junta was originally unimpressive architecturally with simple adobe houses described as both small and dirty. That changed by late 1840s as the community continued to grow and thrive. In 1849, Alexander Barclay, a well-known trader established a large outpost at La Junta. Known as “Barclay’s Fort,” the ornamented adobe structure became a very popular stopping point along the trail. The fort bustled with trading activity daily, served as a stagecoach station, provided housing for men, and shelter for animals. The foundations of the building remain intact and visible within the historic district today. The Samuel Watrous Ranch House is one of the most impressive sites in La Junta. It fell to disrepair but has recently been completely restored. Around the same year, Samuel B. Watrous and his family settled in La Junta. After purchasing a one-seventh interest in the Scolly Mexican land grant, he built a huge ranch house and store at the junction of the Mora and Sapello Rivers. The house itself was described as a “fort-like” adobe with twenty rooms ringing a large interior patio and courtyard. One end of this one-story, territorial style building contained the store and two massive storerooms. Today, the owners of the Watrous Valley Ranch, located at 2286 Hwy 161, Watrous, New Mexico, still use the Samuel B. Watrous Ranch House and Store. The ranch includes the carefully restored Watrous House and thousands of acres of original grazing land. Samuel Watrous was also an avid horticulturalist known for planting various species of foreign trees in the valley. Hundreds of his original Black Willow and Cottonwoods remain on the site. In the 1860s, descendants of James Boney returned to the Valley and resettled in what is now the West Tiptonville area. Boney’s son, Santiago Bone Jr., built a simple rock and adobe home that remains today. The Bernardo Salazar House and the Trinidad Lopez House, homes of James Boney’s daughters and their husbands, are also still standing. The Boney family donated land to Jesuit priests for the construction of a church, rectory, school and cemetery. Built in 1870, the Sagrado Corazon Mission ministered to a parish extending from Las Vegas to Trinidad in Colorado. The foundations of the mission, rectory and school are visible in the district, as is the historic cemetery. More sophisticated buildings such as a log and adobe stagecoach station, brick commercial buildings, and adobe homes in the Territorial style still stand in the Tiptonville area. The Briggs and Roberts Building, Andres Salazar Building, Juan Romero Building, Selas Martinez Building are examples. The Briggs and Roberts Building, which may have been a store or saloon, is on Church Street at the entrance of the Cimarron Cutoff into the village. In 1879, the railroad town of Watrous was established just east of La Junta. The population of La Junta largely moved to the new village as rail travel and trade made the Santa Fe Trail obsolete. At the southern tip of the district, where the Mountain and Cimarron Branches merge, is the log and adobe Gregg Tavern-Stage Station, which served the Barlow-Sanderson Stage Line in the l860s and 1870s. Also in this area are the Fort Union Corral Buildings, where muleskinners may have cared for the cavalry horses. The Phoenix Ranch south of the Mora River and west of the settlement of La Junta is the site of one of the finest Territorial period residences in New Mexico. Dating from the l860's, the two-story square plan ranch house has a two-level gallery extending around all four sides and Greek Revival details on the window and door surrounds. The rock barn and other outbuildings may date from the same period. James Boney's Pueblo de Santiago, the original settlement in the valley in 1835, may have been on the ranch property. By the late 1860s and early 1870s, trade and travel along the Santa Fe Trail was beginning to slow due to the westward extension of the railroad system. 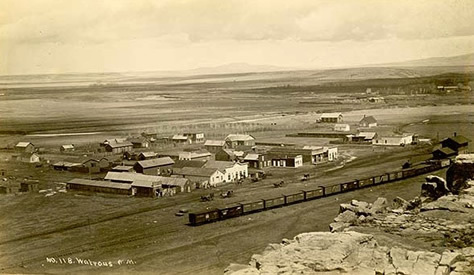 La Junta’s ultimate decline occurred after 1879 when the chief engineer of the Santa Fe Railroad laid out a new town just to the east of La Junta to service the railroad slated to arrive there. The new city took the name of Watrous in honor of local pioneer, Samuel Watrous. Today, Watrous (La Junta) is a National Historic Landmark district that includes the routes of the Santa Fe Trail that originally came together in the La Junta area and buildings and structures associated with the community’s active use (1835 to 1879) during the days of trade between the United States and the vast western territory of Mexico. The economics of the valley shifted to center around the railroad leaving the formerly bustling trading town of La Junta largely abandoned. Much of the original character and integrity of La Junta remain today, from its rustic built environment to the natural beauty of the rangeland in the valley. Throughout the district, deep trail impressions and wagon wheel ruts still dot the landscape. Watrous (La Junta) is a National Historic Landmark historic district located in Watrous, NM along Route 85, north of Las Vegas, NM, along the Santa Fe National Historic Trail, which is part of the National Park System. Click here for the Watrous (La Junta) National Historic Landmark file: text and photos. The historic Samuel Watrous house is privately owned and operated by the Watrous Valley Ranch and is located at 2286 Hwy 161, Watrous, NM. 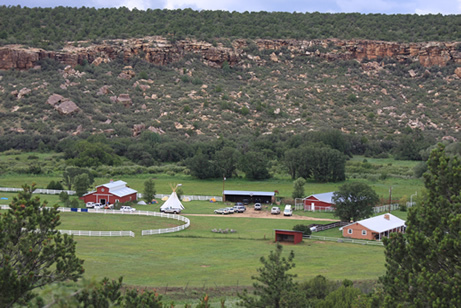 For more information, please visit the ranch’s website or call 505-425-1500. The Watrous House has been documented by the National Park Service’s Historic American Buildings Survey. The Santa Fe Trail is featured in the National Park Service Places Reflecting America's Diverse Cultures: Explore their Stories in the National Park System Travel Itinerary and many other historic places along the Santa Fe Trail are featured in the American Southwest Travel Itinerary.